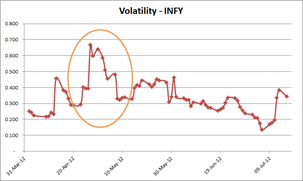 Volatility is probably the most widely used but poorly understood concept in finance. When people talk about volatility, they are usually referring to historical volatility. Historical volatility is quite simply, a measure for variation of price over time. If you look at the chart on the left, you can immediately tell that the stock is highly volatile. The daily candlesticks are long and you see prices break through Bollinger Bands frequently. For an investor, volatility can be, at times, gut wrenching. You might see your stops taken out the day the stock closes up 10%. Investors in blue-chips might think that they are immune to volatility. That maybe true in bull markets, but in the side-ways/bear that we are in right now, volatility affects everybody. Gaps: if you only use closing prices (close-to-close volatility), then you are not accounting for gap-up and gap-down opens – i.e., stocks don’t necessarily open where they closed the previous day. Side note: At StockViz, we use the Yang and Zhang volatility for stocks and close-to-close estimator for indices. 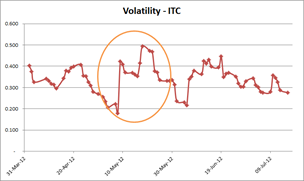 Historical volatilities are important while considering investment/trading decisions. It affects where you put your stops and your time horizon. Higher volatility in long term investments result in a wider distribution of possible final portfolio values, so if you are looking to invest for your retirement, stay away from highly volatile stocks. Remember: Higher volatility implies higher Risk, and may not come with higher Reward.